At our signature Radical Remission Workshop, you will explore and apply the nine healing factors that Dr. Kelly Turner found in common among the thousands of radical remission cases she has studied. You will also learn how your lifestyle choices can significantly improve your immune system, and discover what is possible when it comes to lasting healing. All Radical Remission Instructors have completed the Radical Remission Teacher Training and are certified to conduct 9-week, 3-day, and 2-day workshops. Use this page to find a Radical Remission Instructor to conduct a workshop in your area, or to find a workshop near you. Allison is a lifelong educator and is delighted to be joining the Radical Remission team as a Certified Radical Remission Health Coach and Radical Remission Instructor. Cancer has had a frequent presence in her life beginning with her mother’s illness and then her own diagnosis in 1999. As a 3-time cancer survivor, she has been in remission for 10 years and was thrilled to discover Dr. Turner’s work which validated experiences in her healing journey. Allison is committed to empowering those affected by cancer and helping them navigate the journey as an active participant in their healing. She has a depth of experience gained through her exploration of conventional and complementary medicine as well as her work as a hospice volunteer. Allison has a Masters in Teaching degree and is completing her ICF coaching certification. Allison is an avid traveler, nature lover, photographer and curious soul. She is forever grateful to her mother for showing her how to LIVE with her cancer. Email Allison by clicking the ‘envelope’ symbol below. Dr. Kelly Turner and the Radical Remission Project. Dr. Turner’s research validated the steps that Cynthia had unwittingly used in her healing. It seemed like a fortuitous omen. She is a lover of life and adventure and has worn many hats-ballet dancer, actor/director, professional photographer, legal assistant, mother, wife, and owner of a wine bar/art gallery. After her diagnosis, the focus became to help others, especially in their cancer journey. She became a certified life/health coach with an emphasis on Cognitive Behavioral Coaching. She leads Mindfulness workshops and is a level one Reiki practitioner. In her spare time, she is a volunteer team leader for Global Volunteers and has led teams of volunteers to the Blackfeet Reservation in Montana, Cuba and to the Appalachians in West Virginia. She is Vice President of the Board of Columbia Basin Cancer Foundation, Moses Lake, WA. She is honored and excited to be a Radical Remission coach and workshop leader and helping others to incorporate the 9 healing factors into their lives. She is available for workshops in WA, OR, ID, MT and AZ. Email Cynthia by clicking the ‘envelope’ symbol below. Cindy is a family therapist, coach, counselor, & workshop leader. She’s had the great pleasure of working within private, residential, educational, & corporate settings as her 25-year career has evolved and expanded. As Regional Network Director for Six Seconds Global Emotional Intelligence Network, Cindy taught clients to cultivate their EQ to improve their relationships and discover their purpose. In large and small workshops, Cindy trains groups in SEL, facilitates creative expression circles, and hosts integrative parenting classes. In her private practice, Cindy supports people & families wanting to transform their lives after life altering events or diagnoses. Cindy’s passion for synthesizing knowledge and experience across various disciplines allows for a very personalized approach to connecting with and assisting others in discovering their own empowered journey to optimal health and wholeness. After receiving a brain tumor diagnosis in 2015, Cindy began practicing all 9 Factors in Dr. Kelly Turner’s book: Radical Remission. Cindy completed the Radical Remissions course in 2016 and in 2017 went on to train with Dr. Turner to become a RR Workshop Facilitator. Today, Cindy is a Radical Remissions Survivor and certified Health and Wellness Coach, specializing in holistic nutrition, cultivating intuition, somatic awareness, and integrative oncology. Email Cindy by clicking the ‘envelope’ symbol below. not only offered a more complete view of healing for Lodi but gave her a strong sense of hope and empowerment. Hope that healing was in fact possible for her, and empowerment to take on the role of CEO of her own health. Lodi was so passionate about Dr Turner’s work that when the opportunity arose to take part in the first Radical Remission Teacher Training with Kelly Turner she jumped at the chance. Since then she has also become certified as a Radical Remission coach. With her background in teaching, experience as a cancer patient, and Radical Remission teacher certification, Lodi is knowledgeable, experienced and inspired to share what she has learned with others. Lodi holds a Bachelor’s Degree in Psychology and a Master of Arts in Teaching. Email Lodi by clicking the ‘envelope’ symbol below. Kirstin is an inspirational guide to health and wellness. Her unique perspective and approach builds on a strong medical foundation, experience in the pharmaceutical industry, a deep interest in complementary and alternative approaches, and significant personal experience supporting family, friends, and herself, through cancer. Kirstin is a Registered Nurse (RN), who qualified at the world-famous Nightingale School of Nursing, in London. She is also registered in California and Washington (pending). Kirstin also holds B.Sc. in Psychology from the University of Westminster, London, where she studied psychoneuroimmunology (the effect of the mind on the immune system) and a Master’s in Forensic Psychology at the John Jay College of Criminal Justice in New York. In addition to her many years nursing, Kirstin spent several years in the pharmaceutical industry, where she was involved in the education of medical personnel in the advances of mental health therapies. Kirstin’s son was born with Neurofibromatosis 1, a rare genetic disorder that has resulted in three brain tumors and many non-tumor related complications. Due to limited treatments for his condition, Kirstin has spent 15 years researching and implementing alternative and complementary therapies to aid in his well-being. This background helped Kirstin greatly when she was diagnosed with triple negative breast cancer (she has been cancer free for five years now). Kirstin has also been an inspirational guide to other friends and family members with cancer and other major diseases, and is currently guiding her husband, who was recently diagnosed with stage IV melanoma, to thrive and live a full and productive life. Kirstin views Dr. Turner’s work as providing a comprehensive roadmap for approaching a cancer diagnosis. It provides hope and practical tools that can be used to help your immune system fight the disease and to heal at an emotional, spiritual and/or physical level. Kirstin would love to share this invaluable knowledge with you. Email Kirsten by clicking the ‘envelope’ symbol below. Lindsay Beane, DrPH, is a public health expert who has worked in Baltimore’s impoverished neighborhoods for 25 years. Though she herself has never been diagnosed with cancer, she lost her mother to lung cancer and was also faced by her second son’s diagnosis with an incurable lung-GI disease called cystic fibrosis. Though he was only a baby, she started him on a regimen of acupuncture, osteopathic treatments, homeopathic remedies, nutritional supplements, and herbal tonics. Over time, Lindsay watched intently as her son transitioned from a very sick baby into a lively boy and, today, a strong and healthy young man. Because she valued alternative approaches, Lindsay was immediately drawn to Dr. Kelly Turner’s book (Radical Remission: Surviving Cancer Against All Odds) when it was published in 2014. She knew that the 9 healing factors described in the book would be of benefit to anyone, with or without cancer. In 2017, Lindsay was excited to complete Dr. Turner’s Radical Remission Teacher Training. Lindsay is available to teach a 6-session “Radical Remission: 9 Healing Factors” Workshop for groups of 5 to 15, either in informal home settings or institutional settings (hospitals, primary care and wellness clinics, cancer treatment centers, senior citizen centers, churches, etc.). The Workshop fee is $149 per person, with a limited number of discounts available based on need. Lindsay will be happy to provide an Introductory Session (1 ½ hours and free of charge) for groups wishing to learn more before they commit to the cost of a full Workshop. She serves the Maryland-Delaware-Pennsylvania area. You can read Lindsay’s Radical Remission HEALING STORY of the MONTH (March 2017) about her son here. You can also read her public health essays and excerpts from her soon-to-be-published memoir about her son’s journey, Embracing The Dragon, on her website: www.LindsayBeane.com. Email Lindsay by clicking the ‘envelope’ symbol below. Pat Berger is a certified Maya Abdominal Therapist, a Self Care Instructor, a Licensed Massage Therapist, and teaches both Yoga and Breath Work. 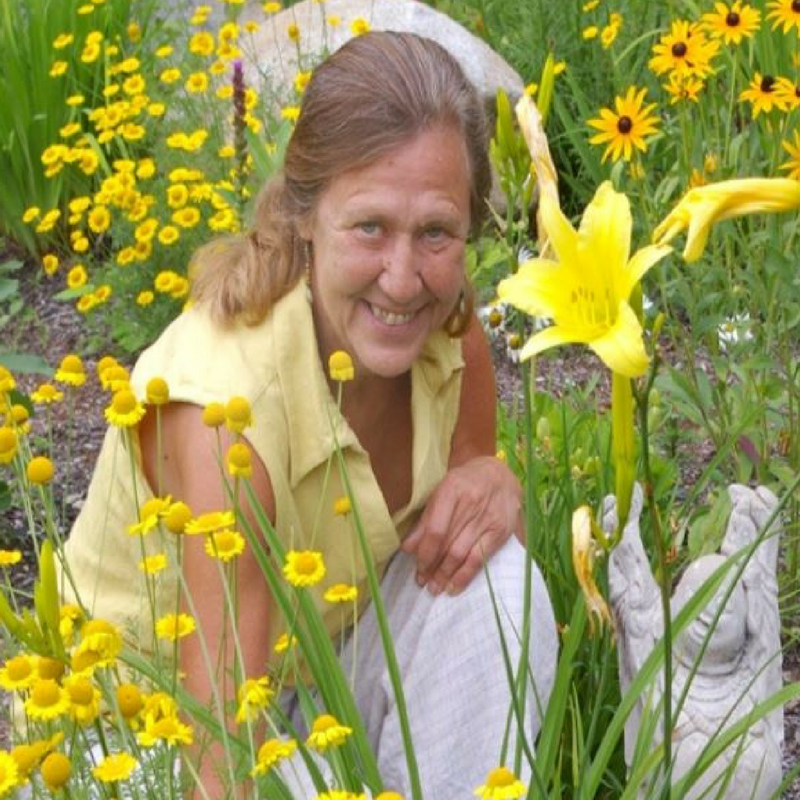 She owns and operates her own Wellness Center in Sidney, Maine. Email Pat by clicking the ‘envelope’ symbol below. Irina is an inspirational health and life coach who draws from her unique qualifications in conventional and non-conventional medicine, combined with her personal experience as a cancer patient and healer. She holds the hand of people going through significant health challenges and helps them find their footing, courage and their own clear path through the jungle of confusing options and hard decisions. As a physician, trained in OB/GYN, Irina worked in Germany and the US (George Washington University). In addition to her roots in conventional medicine, she received an education in complementary medicine for physicians and is certified in different energy healing modalities. Irina strongly believes that cancer – and other chronic diseases – can be healed and even be prevented by addressing and balancing out the whole person – mind, body and spirit. She feels when it comes to healing, keeping an open mind is important. Whatever brings results should be considered, and no method discounted. For Irina, integrating ‘Western’ and ‘Eastern’ medicine – tailored to each person – has the potential of achieving outcomes that are truly the “Best of Two Worlds”. As a survivor of two BRCA cancers (melanoma and advanced breast cancer) and a mother of three, Irina knows first-hand what a cancer diagnosis means for a family, especially when it is related to an inherited gene mutation. Yet, Irina believes that no person is a victim of their genes or diagnosis. Her experience in integrative medicine and trust in energy healing helped her approach her own cancer with a positive mindset, strong faith and deep intuition. Drawing from both conventional as well as non-conventional options, she was able to achieve complete remission against all odds and has been cancer-free for seven years. When Irina read Dr. Kelly Turner’s book ‘Radical Remission’, published soon after Irina’s own fight against cancer, she recognized the significance of the material right away. The nine factors described by Dr. Turner matched exactly what Irina’s own intuition had guided her to do in order to heal herself. Irina is passionate about bringing this wisdom to the attention of as many people as possible. As a Duke-trained Integrative Health Coach and Holistic Life Coach (certified by the Wisdom of the Whole Coaching Academy), Irina especially feels drawn towards working with people who face a life-changing diagnosis and guiding them out of their fear into an empowered role to conquer their health challenges with courage and a positive spirit. Email Irina by clicking the ‘envelope’ symbol below. Kristi began her journey in the health care field as a Speech-Language Pathologist. She has a Master’s degree in Communication Disorders and a Minor in Health Education. She has spent many years working with clients of all ages. A brain cancer diagnosis in 2103 started her on a path to wellness and she now considers herself a “cancer thriver”. Kristi is a Holistic Health Coach having studied at the Institute of Integrative Nutrition and is also a Certified Laughter Yoga Leader. She has studied at the Raw Food Institute and the Kushi Institute. She is currently working on furthering her coaching skills in the areas of overall wellness and oncology. She is an advocate with the National Brain Tumor Society and also serves as a mentor with the American Brain Tumor Association. Kristi became a Certified Radical Remission Instructor after attending the inaugural Radical Remission Teacher Training Program in October of 2017. She lives in the Boston Metro area and is excited to share Dr. Kelly Turner’s work with others. Read Kristi’s healing story HERE. Email Kristi by clicking the ‘envelope’ symbol below. Corinne Lemal Danielson has served as Center Director for the Sari Asher Center for Integrative Cancer Care, a non-profit in West Palm Beach, Florida since March 2009. One of her favorite aspects of this work is her opportunity to assess new patients and work with them to develop a recommended plan of care for supportive therapies and lifestyle behaviors. She recommends Radical Remission to all the patients the center serves and talks about the 9 factors regularly in patient assessments. Ms. Danielson has her master of public health from Emory University in behavioral science and health education and has been a Certified Health Education Specialist since 1996. Corinne has lived and worked throughout Latin America, is fluent in Spanish and Portuguese, and through her multicultural experiences has been exposed to health beliefs and healing practices from all over the world. She is always exploring natural health and wellness studies, therapies and nutrition to learn more about human wellness and behavior change. Corinne has trained in the practice of Mindfulness and Wellness Coaching and considers herself a “wellness warrior”. Email Corrine by clicking the ‘envelope’ symbol below. Kathryn Doherty is a Certified Radical Remission™ Instructor, coach, speaker and breast cancer survivor. She leads retreats, workshops, and has presented internationally on the Nine Healing Factors identified by Dr. Kelly Turner. Kathryn’s experience with cancer spans over 40 years – as an advocate and caregiver for her mother, father, then husband, and most recently as a patient. Cancer was the wake-up call that redirected her life. Her diagnosis was reversed without surgery, chemo, or radiation. A designer in her professional career, Kathryn was Creative Director for her Product Design firm, Creative Consultant for Unilever, and Promotion Art Director for CBS Publications. It is her personal experience and the global impact of this disease that fueled her commitment to support and engage with those affected by cancer. Email Kathryn by clicking the ‘envelope’ symbol below. A4M Fellowship in Integrative Oncology. Candidate, Masters of Science in Nutrition and Integrative Health (graduating June, 2018). She is pleased to be offering Radical Remission workshops as a trained workshop facilitator and coach. Email Kim by clicking the ‘envelope’ symbol below. For more information or to register call 305-926-7982 or email Kimberly Kirschner by clicking the ‘envelope’ symbol below. Debra Nozik proudly became certified as a Radical Remission teacher in December of 2017. She has been working as a licensed Clinical Social Worker since 1978. She currently works as a psychotherapist in Albany, NY. Debra has been a support group facilitator at “To Life!,” a breast cancer support and education organization in Albany, NY since 2007. Debra was diagnosed in 1999 with metastatic breast cancer and is a radical remission survivor/thriver. Email Debra by clicking the ‘envelope’ symbol below. Andrea is a wellness coach and member of the International Association of Wellness Professionals. Her coaching specialty is holistic support for cancer recovery, focusing on helping clients find ways to implement the Nine Healing Factors of Radical Remission into their own lives. She followed her intuition when choosing treatment for an ovarian cancer diagnosis and believes she is alive today because of that. She feels that intuition is a vital, but often unrecognized, part of recovery and healing. Email Andrea by clicking the ‘envelope’ symbol below. Deborah Stuckey - Washington, D.C.
Deborah Stuckey, Ph.D. has had a clinical psychology practice for 35 years. She was trained at Wesleyan, Harvard and Boston Universities. Previously she specialized in the treatment of eating disorders, couples and family issues. Since being diagnosed with advanced breast cancer in 2013, she has immersed herself alternative treatment for cancer and the healing process in general. She has presented workshops and talks nationally and internationally. Workshop attendees have described her as warm, brilliant and funny. She lives in Washington, DC and has a practicer in Bethesda, MD. Email Deborah by clicking the ‘envelope’ symbol below. Radical Remission by Dr. Kelly Turner was central to White’s personal radical remission. White is such a believer in the 9 key factors outlined in Radical Remission, she is thrilled to have to opportunity to teach others. Having defied medical expectations, White has catapulted her recovery journey into a platform to help others. She rededicated her life to helping cancer patients find hope and stressed-out, workaholic parents manifest more wellness and joy in their lives. White has inspired countless people with the badasscancerbabe platform: her treasure trove of remedies she discovered to heal mind, body and spirit. Email Tracy by clicking the ‘envelope’ symbol below. Email Mariah by clicking the ‘envelope’ symbol below. Mary Ann’s professional history is in marketing and sales, but alternative healing practices have always been a keen interest from adolescence thru adulthood. Several years ago after an annual routine physical, a grapefruit size tumor was found attached to her ovary. It was then when she came upon Dr. Turners book. After a radical abdominal hysterectomy, Mary Ann decided it was time to incorporate many of these factors outlined in the book into her life, even though the pathology report came back negative. She began sharing these factors with cancer and non cancer health challenged friends who also benefited greatly from this scientific based information in Kelly’s book. Now as a Radical Remission Certified Teacher, she am honored and thrilled to share Remission Research: 9 Key Factors for Health with others in her community! Email Mary Ann by clicking the ‘envelope’ symbol below. Passionate about facilitating empowerment, transformation, and healing in those who have been diagnosed with cancer as well as those seeking to prevent it, Annette Meinzer is a Certified Radical Remission Coach and Instructor. Annette obtained her BSN in Nursing, is a Board Certified Nurse Coach, Certified Stress Management Instructor, Certified in Clinical Meditation and Imagery, and has received extensive training in energy healing therapies and Transpersonal Coaching. She has been entrenched in the field of Mind-Body-Spirit Healing and Holistic/Integrative medicine where the whole person is incorporated into the care and healing process for the past 14 years. She believes that we can take an active role in our healing process which will strengthen our immune system and could lead to radical remission. Annette began her conquest into alternative healing techniques and remission after both her husband and mom were diagnosed with cancer in 2003 and 2005. She resides in the Cincinnati, Ohio area and is a mother of five children. While she did lose her mom to cancer her husband was able to recover although unfortunately passed away in 2015 to other causes. Through these challenges she developed an inner strength and resilience and learned the art of pushing forward and living again despite the obstacles and adversities that we are challenged with. She learned how to move on from the “moment of impact”, whether it is due to a diagnosis or loss, to the creation of a new life filled with joy, peace, and love. Her mission in life is to now assist others and walk with them on this journey. Annette would love the opportunity to connect virtually with you, from anywhere in the world, through video-conferencing. Please contact her for details. Email Annette by clicking the ‘envelope’ symbol below. Hearing the three words, “You have cancer,” forever changes the person you used to be. Caryn believes there is a silver lining or gift in all things and circumstances. Stage-4 appendix cancer is no different! During her treatment, Caryn was gifted the book, Radical Remission written by Dr. Turner, when she recognized she already had incorporated the 9 healing factors into her life. As a lifelong learner, Caryn holds many alternative energy healing certifications and has studied metaphysics for the past 15+ years. She is certified to teach Radical Remission workshops and is working towards her holistic life coach certification for one-on-one coaching with Radical Remission. She currently is a Mentor Angel with Imerman Angels, providing one-on-on cancer support. Email Caryn by clicking the ‘envelope’ symbol below. Michelle is a survivor of a 2009 diagnosis of breast cancer and a 2017 patient of stage IV cancer; thus, her passion for taking control of one’s health is strong. She is a collector of enriching experiences and lifelong learning: a US Navy veteran, she holds a Bachelor’s Degree in Communications from Purdue University with a minor in art/design; she’s served internships at The Children’s Museum of Indianapolis and Walt Disney World College Program. Michelle learned Spanish as a returned Peace Corps volunteer in special education and is a 200-hour certified yoga teacher. She is active in learning about non-violent conflict resolution, race and bias, and being a voice for those with developmental disabilities. She enjoys time creatively problem-solving her own healing journey with her fiancee, his sons and her dog, Osito. Email Michelle by clicking the ‘envelope’ symbol below. Mari met Kelly Turner in Helsinki 2016, when her book ”Syövästä Voi Selviytyä” was published in Finnish. She was so excited about Kelly’s presentation that she didn’t even notice that Kelly was talking in another language, it just resonated with her heart. She was thinking that this might be the key to other autoimmune diseases, not just cancer. When Kelly told about upcoming first Teacher training 2017, Mari decided deep in her heart that she need to be there. Mari graduated as a part of the first Teacher Training. Besides Radical Remission workshops, Mari works in her home town as a Body and Mind Balancing Therapist and EFT Therapist (releasing stress and suppressed emotions). Visit Mari’s Radical Remission Profile HERE. If you are a warrior and your heart resonate with beautiful Finnish nature you are welcome to join her courses in Finland. Courses are translated in English if needed. See all of her upcoming courses in Finland. Email Mari by clicking the ‘envelope’ symbol below. At 45 years old Justine was diagnosed with a Stage 3 aggressive colon cancer. She embarked on an enlightening journey to find out the best possible course of treatment to stay alive and healthy. Her father had passed away of colon cancer which made her realise that she didn’t want to go down the conventional path of healing. Justine opted to have surgery but opted out of the traditional treatment options and decided she could help heal herself by using integrative and holistic methods. No Chemo & No Radiation! Justine understood that a bigger part of her healing would involve continual exploration into what her body, mind and soul needed on a day to day basis. Justine is now cancer free 5 years from diagnosis. Justine found “Radical Remission” at an integrative clinic she took a friend to for his cancer treatment a couple of years after her diagnosis, and soon discovered that she had applied the 9 healing factors into her journey towards wellness. Her cancer journey has led her to train as a life coach and Integrative Nutrition Health Coach where she’s works with cancer patients, helping them to navigate their own healing path. She also has an ozone therapy business and runs a prostate cancer support group for men in her region. Justine traveled from New Zealand to attend the Radical Remission Teacher Training in 2017. Email Justine by clicking the ‘envelope’ symbol below. Julianne trained at our inaugural Radical Remission Workshop Teacher Training in 2017. After receiving a diagnosis of Triple Negative Stage 3 Breast Cancer in 2015 and a mastectomy Julianne’s journey began in looking further at Mind-Body-Spirit Healing. Julianne had lost her sister earlier to a brain aneurism. Her mother carries the Lynch Gene and has had ovarian and bowel cancer. Julianne did not wish her family to go through any more grief and she decided to research what was available to heal both herself and her mother. She was recommended the book Radical Remission that had recently been published and this resonated with what Julianne was looking for. Having her three daughters in her care and her sister’s daughter living with her as well, she had a very strong reason for living. Julianne completed 1year of Human Development Training in 1996 and has always had an interest in Holistic & Integrative Medicine. She completed a course in Thought Field Therapy in 2004. She has also been chairperson of Breast Cancer Network. During this time Julianne worked with a team of women who organised workshops and published a tri monthly magazine with current information on healing through mind body and spirit. Julianne has also completed a Mindfulness workshop and uses mindfulness as a daily practice. Following the 9 Factors of Radical Remission has shown Julianne that the power of healing her body has given her an insight into an overall improvement of her health. She is passionate about sharing this with people in her community by facilitating Radical Remission Workshops. Julianne is the mother of three daughters. She lives on a lifestyle block in the community of Greenhithe on Auckland’s North Shore. After Julianne’s diagnosis she planted her own organic garden and thrived on feeding her body with organic vegetables from her garden. Julianne previously had her own café and worked as a chef in a retirement home. She believes that teaching people how to grow their own vegetables and make healthy whole food meals is a step in healing the body. She also completely detoxified her home and has a list of natural homemade products that you can make on a budget to eradicate toxins in your environment. Julianne has learnt to listen to her intuition and it is through this she has found her passion in life, to share what she has learnt with others. As she has found this has given her a new lease on her life and she fill’s every day with those things that bring her love, laughter and peace. Julianne will be offering Radical Remission Workshops in New Zealand in the future. Email Julianne by clicking the ‘envelope’ symbol below. Sandra Reich is the Founder and Clinical director of the Montreal Center for Anxiety and Depression, Co- Director of Empowered Women Workshops, Co-Director of Anxiety Videos and Founder of Sandra Reich Couple Retreats. She is a bestselling author of a self-help book called “Once upon a Time…How Cinderella Grew Up and Became a Happy Empowered Woman” Sandra is also the host of a hugely popular international radio show called Straight Talk with Sandra Reich heard weekly on Voice America. Sandra’s expertise has been featured on many radio and television shows including Discovery Health, Global TV, Breakfast Television, APTN, and recently on Celebrity Damage Control which is currently airing on The Oprah Network (OWN). Sandra has studied extensively with some of the biggest health experts in the world and gives workshops on learning to live your healthiest life. She also speaks across North America as a keynote speaker on how to treat and deal with anxiety, depression as well as how to live your very best life. Email Sandra by clicking the ‘envelope’ symbol below. Email Maite by clicking the ‘envelope’ symbol below.